Materials used in this chapter were published in the book Biostimulant Albit for increasing yields and protection of agricultures against diseases, A.K. Zlotnikov, Ed. Prof. А. Melkumova. All-Russia Institute of Plant Protection, Russia, 2006. On french bean, Albit is applied as antidote for decrease of side phytotoxic effect of pesticides. In Russia, Albit is officially registered as a plant growth regulator of french bean. Albit increases field germination capacity, accelerates plant growth and development, improves plant resistance to unfavorable conditions of the environment, provides defense against plant diseases, increases french bean yield and improves the yield quality. Application recommendations. It is recommended presowing seed treatment (50 mL/t) and foliar spraying at the budding stage (30 mL/hа, ВBCH 50-60). On french bean, Albit has been tested since 2001 in field trials of All-Russia Institute of Vegetable Selection and Seed Breeding (Moscow oblast) and in other institutes and farms, including foreign countries – China, USA, Turkey and others. On french bean var. Minutka and Sekunda Albit was applied in 2001 and 2003 for seed treatment (50 mL/t) and for foliar spraying at the budding stage (30 mL/hа). According to long-term field trials, Albit application increased french bean yield by 0.45 t/ha (16.3%) and also field germination by 5-10%. 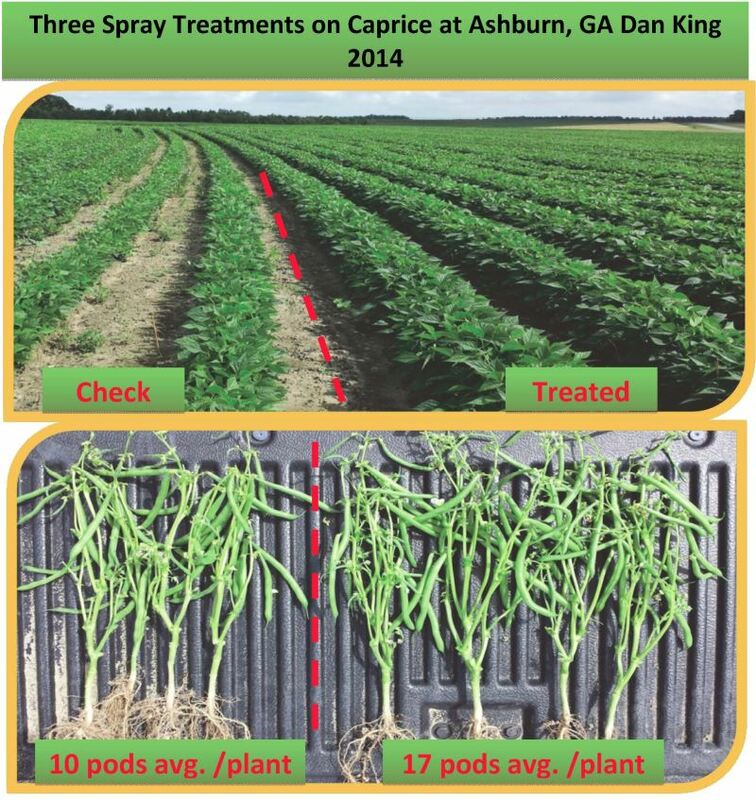 In 2014, 3-fold Albit application on french bean var. Caprice promoted to development of vegetative mass of plants, root system, earlier and harmonious flowering; the number of pods per plant was by 70% more, than in control (Fаrm Dan King, Ashburn, Georgia, USA, Fig. 1). In 2011, Albit was applied for seed treatment of french bean (province Shandong, China). 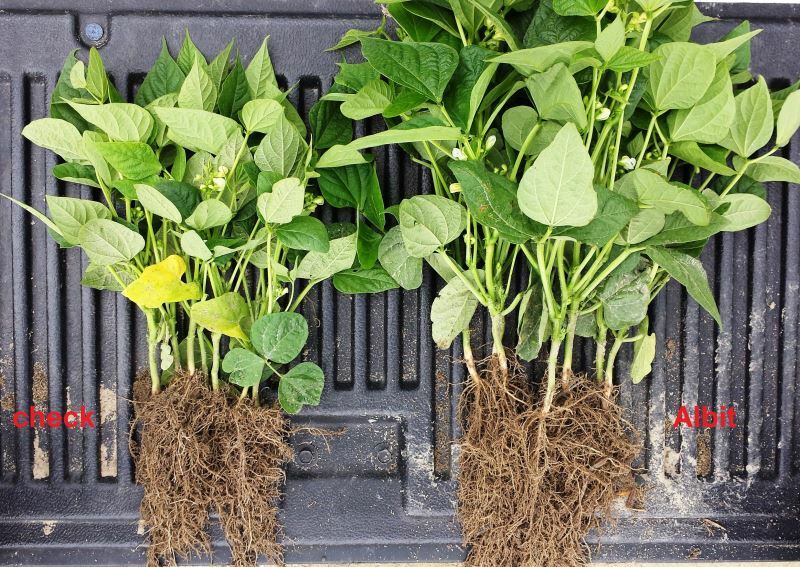 20 days after Albit treatment, plants had by 2 leaves more, than untreated plants and were in 2 times higher; length of roots was by 50% more, than in control. In 2016, Albit was applied in Turkey. 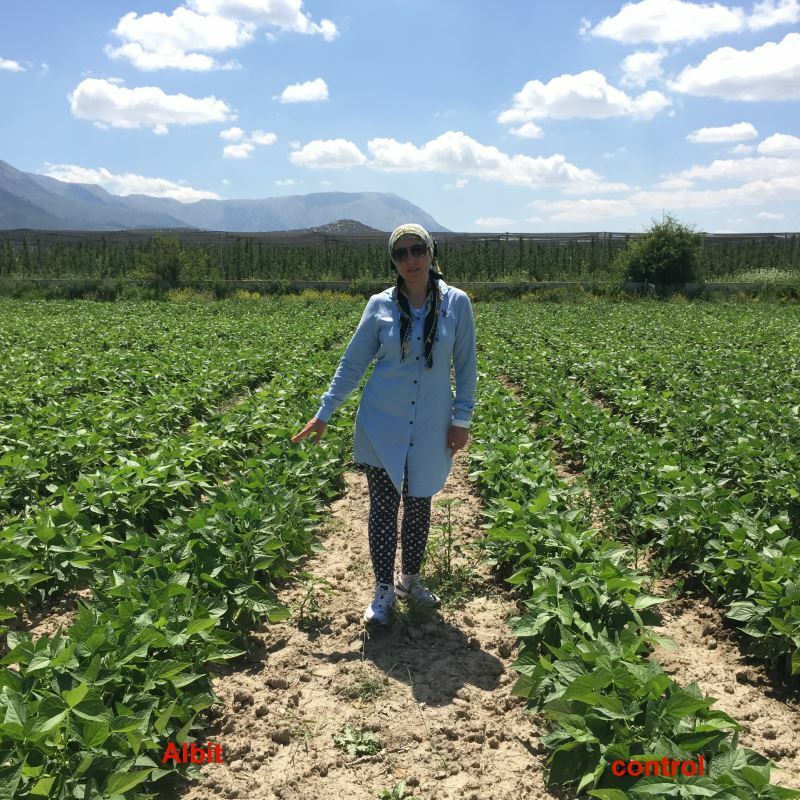 In conditions of dry summer in province Isparta, Albit application gave 3 t/hа of french bean extra yield (yield increase was 30% to control) (Fig. 2).